I conducted the following interview back in August of 2009 for the Finnish zine, "Graveless Spirits." I'm copying it here in the off chance that some poor sonofabitch is bored enough to hear a younger version of myself ramble about miscellaneous junk. I'm leaving in the bits about aborted and postponed projects and things that could've been, because they make it a bit sadder of an interview for yours truly. ZW: Thanks for having me. 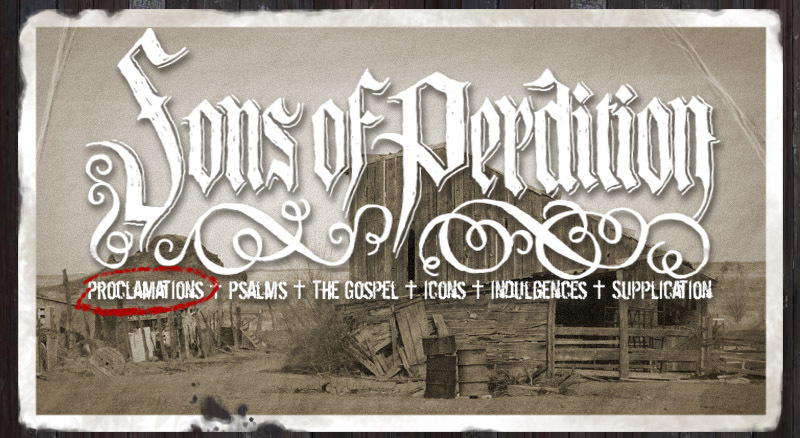 Well, Sons of Perdition started out as a side project while I was working with a couple of other bands. I found myself gravitating more and more toward slower, more rural sounds. Eventually, Sons took over and edged the other bands out of my vision. There was probably an eclipse that day. GS: And, pray tell, why the name Sons Of Perdition; and particularly, why in plural considering that the only constant participant is you? Or are you in fact Legion? ZW: It's an utterly hopeless name, the most inescapably damned of the earth. Even God can't save the Sons of Perdition. That concept strikes a chord with me and works well with what I'm trying to do with the band. The plurality of the name probably has more to do with my original plan of a full-fledged band than my possession by demons. But yeah, I'm also that. GS: On the album, you identify yourself as Zebulon Whatley. Any relation to the Whateleys of Dunwich? ZW: Very little. My forebears broke off from that clan a generation or two before the incidents at Dunwich. My family has always tried to keep distance from those folks. ZW: Considering that I worked on the album for over three years, there are no stones that I didn't overturn multiple times. I actually recorded most of the songs on the album at least twice. I let it mutate for awhile before I finally closed the door on it and considered it created by someone else and thus untouchable by my hands. So as an album, I think it works and I enjoy it to some degree. I can't say that I'd ever remake it, though. GS: According to your website, you plan to release this second album only on vinyl and downloadable mp3, not CD. Why is that? ZW: Vinyl is heavier. It feels less like a product. And the artwork is bigger. Releasing exclusively on vinyl and MP3 is something that I've been talking to GraveWax Records about for awhile and they're very supportive of the decision. ZW: It's much too early to even hint at a release date, but I'm really excited about this one. Lonesome Wyatt and I have been knocking songs back and forth. So far, it has a very old-time religion feel to it, like something you would have heard playing as a church collapsed during the the Dust Bowl. ZW: I try not to be overly influenced by any bands out of respect. They say that imitation is the sincerest form of flattery, but I don't want to rip anyone off. Those Poor Bastards are one of my favourite bands, but the last thing I want to do is try to ape their sound. GS: And what would you say are the greatest influences for your lyrics? ZW: I've gotta be obvious with this one and say religious literature. Not just the Bible, but mythology of different cultures and theologies. Milton, Donne, Alleghieri. As for contemporary authors, Cormac McCarthy, Michio Kaku, Robert Bloch and a slew of others that I can't think of right now. GS: And, continuing on the topic of your lyrics, how do you go about writing them? Do you spend a lot of time mulling over them to get them done just right, or does the Holy Spirit possess you and make them come out in perfect form effortlessly? ZW: The action of the songs are usually entirely fictional (or based on historical references), but I always try to climb into the mindset of the people living out the events. In that way, I'd say that the songs are very honest. I hope I do the characters justice. And I'd be more inclined to say that the music is the necessary evil. It's usually an afterthought, just something that I make up during the actual recording process. That's my excuse for not knowing how to play half of my songs. GS: Being something of a HP Lovecraft-fan myself, and taking into consideration your pseudonym (for I assume it is one): would you say HP Lovecraft is a major influence on your music, lyrics and imagery? ZW: Lovecraft's work was a huge influence on my writing for previous bands that I was in. After I read all of his stories a few times (I'm not too interested in poetry), I moved on. Now, the man himself is more of the influence. His solitude, anachronistic life, stubbornness, sickness... all of these things feed into the tone of the band. ZW: I hope God oversleeps and lets me rot in the ground. GS: And your music; do you think my soul has become stained with sin for listening to The Kingdom Is On Fire excessively, or will it help my wretched soul to reach Heaven on the day of my death? ZW: If it causes you to ponder the idea of God, then I think you're in a better place than where you started. If you unquestioning take every word of it (or anything else) to heart as holy gospel, the fires of Hell surely await thee. GS: Why is it that you chose Country/Folk music, and in this sinister and eerie guise, as your musical approach? Is there something special about Country music that led you to express yourself through it? ZW: It's something that I've always been interested in. Part of it comes from growing up in the South, hearing old country music, going to country churches. The rest probably comes from my technical inabilities as a musician. ZW: The Devil owns it all. GS: Returning to more worldly matters, on your website you mention possible concerts in East Germany; would this be the first time you come over to Europe to perform? And are more European concerts in the plans? GS: And apart from the concerts and the releases already mentioned, do you have other plans for 2009 worth mentioning? ZW: Well, I've been driving around on old Route 66 a bit lately, photographing junk. There will probably be more of that. And I'll undoubtedly creep ever so closer to my eventual death. ZW: It's been a pleasure. Can you lie for me and tell folks I have a beard? An absololute great and comprehensive inteview covering from a to z. What happened with the 7' with Those Poor Bastards was it the soundtrack for Backwater Gospel or another project ? will yo tell about some of your former dead and in the ground industial bands if in anyway buyable,thus you don't like em, they would probably have some interest from the fans. The devil owns it all, he sure does, thanks for this great upload and keep em coming and don't forget Europe and especially Denmark afterwards your upcoming US tour. Thanks for posting that Mr. Whatley. I somehow missed that when it took place so I am glad you let us know about it. I enjoyed that very much. And the industrial music was a surprise to me... hopefully it was somewhat along the lines of Ministry.. They were awesome. Have a good week! I'm glad you folks liked the interview. It was nice that the interviewer really spent some time on the questions. The 7" was just pushed back and pushed back due to time and motivation. We just haven't spoken of it in a year or so, so it's presumed dead. I feel like I'm running in the opposite musical direction of where I was when we first proposed the project, so it might be an awkward fit now. The industrial music was really influenced be bands like Skinny Puppy, Einsturzende Neubauten, Ministry, Merzbow, Front 242, Will, Aphex Twin, Whitehouse, etc. (although not anywhere as good as any of those bands). I might release a couple of songs for free as a curiosity at some point, but they aren't available for sale anywhere. My old band "The Creepniks" has an album floating around, if you're interested, but it isn't industrial. Another of my old bands, GORE KNOBS, presumably still has a MySpace page out there where you can download most of what we recorded for free, but it isn't industrial either. Damn, good to see that this old interview got published somewhere in the end! As it happens, it has never been published elsewhere as I decided to end Graveless Spirits before the fifth issue (where this would've been) was released... too little time, too many other obligations, etc.